The warmth of the desert sun, the contrast of the cool calm water as you reach your hand over the side of the boat; a hawk soaring overhead. Blissful silence in the most sublime and awe-striking wilderness on the planet. Towering red rock walls that for eons have changed with the geologic forces of time create the backdrop, making you feel both small and insignificant as well as a part of the long arc of the planet’s history. These moments and so much more make up our time on the river. We take it in and experience the place in a way that few are privileged enough to. 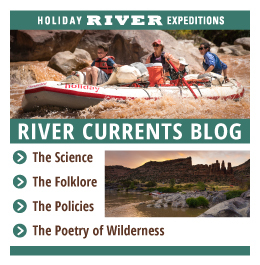 Besides the scenery and the daily musings, what actually make a river trip the trip of the lifetime? Some things that help are a guide to understand what we’re seeing, a well thought out plan of meals and campsites, and of course a skillful rower at the oars. Holiday River Expedition has found a perfect balance of these elements. In my time on the river with Holiday, I have experienced the highest level of compassion and professionalism from the guides. Many of the head guides will have spent countless hours over many trips down the section of river you have elected to float. They remember the rapids and can find the line no matter the water level. They know where the best shady campsites are hidden among the river banks. Perhaps most importantly they are able to gauge the dynamic of their team and the guests to create the best experience of us. Similarly, they know the stories of the river. They can tell you about the people that lived there before Euro-American settlement, the old miners, and of course the biological and geological entities that are present throughout. Stopping at any ruin, or wild twisting fossil embedded in the river bank turns into a story that is both explained and lets the imagination take flight. As with any good vacation, a river trip needs to be fully equipped with five star dining. The guides at Holiday will leave you wanting for nothing with meals ranging from refreshing chicken caesar wraps, to lasagna, to perfectly cooked sirloin steaks. While they prepare these meals, there is time to explore. Grab a life vest and float down the river near camp. Grab a walking stick and hike into a side canyon leading away into a quiet grotto. Then, let the succulent smell of delicious food bring you back to the boats and the company of great people. 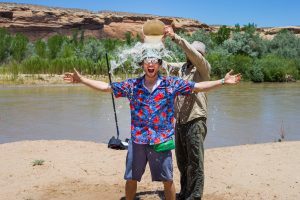 There is a tricky balance between the things that we take for granted in everyday life and the wildness of a river trip. 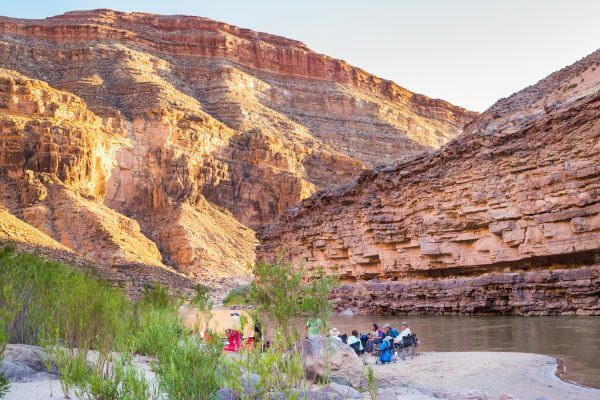 Surely at times you will feel like you are indeed “out there” camping among the the desert landscape, but the guides at Holiday know how to make it comfortable. 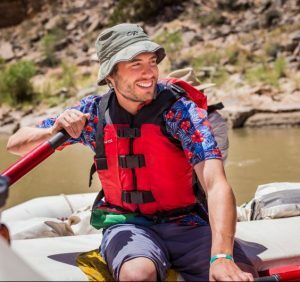 They will explain all the funny nuances of river life, help you in setting up your gear, and be present with any questions that you have. They fully understand that everyone experiences the place differently and are will to cater to that array of interest. 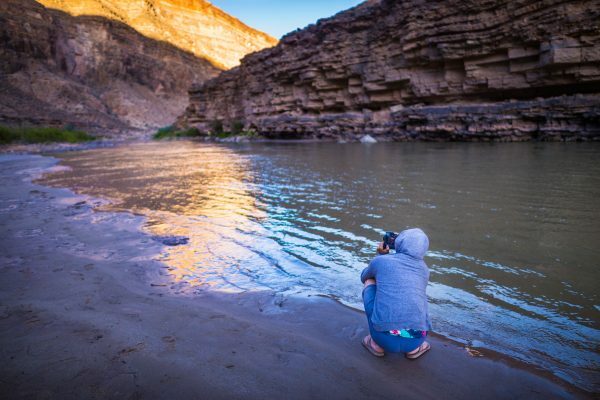 One afternoon on the San Juan River, we had just pulled into camp at the bottom of a small but technical rapid. Our run down the rapid had been smooth and mellow and we slid into a nice takeout just below. We were setting up camp on a large sandy beach and enjoying beverages and the quiet afternoon. Soon, another large party came to the top of the rapid and scouted it. We watched with interest to see how they would handle it. The first boat made it through without problem. The second boat bounced off the wall and spun around, out of control. The third boat went into the rapid totally sideways, and bucked out a passenger carrying a small child. Immediately we saw the distress, and heard the wails of the child. Our guides went into full rescue mode, instinctively throwing a line to the victims and helping pull them in. 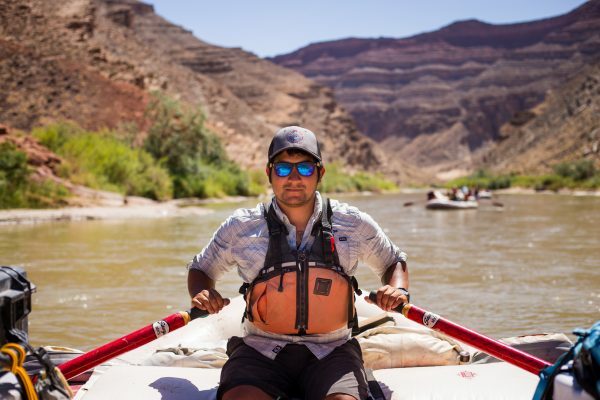 Because of the wealth of knowledge and skills the guides provide and the humbleness they take onto the river, you will call them friends as well as know you are in good hands.